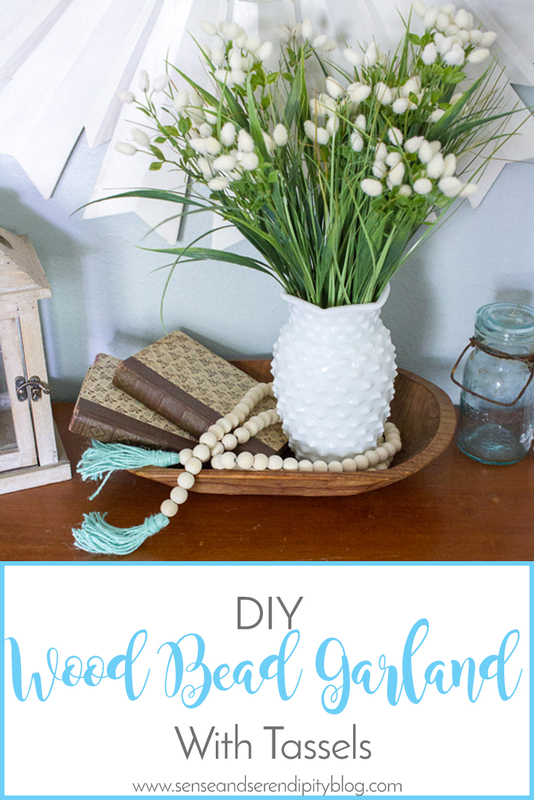 If you’ve been following home decor trends in the past few weeks, you’ll likely have noticed all the wood bead garlands popping up. At first, I wasn’t sure I was a fan but they soon started to grow on me. I knew I could make my own for a fraction of the cost I was seeing them sell for, too. The thing about trendy decor is that if it’s not cheap, I probably won’t try it out in my own home. 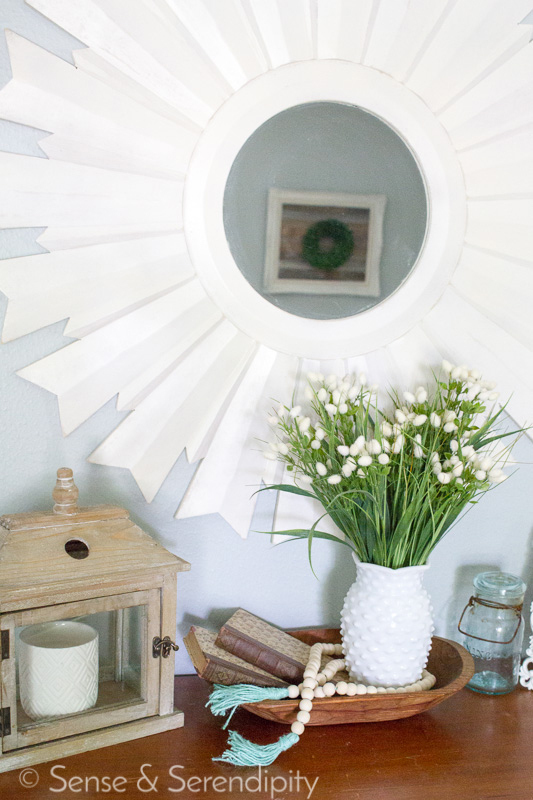 That’s why I love making my own versions of popular decor ideas because if it doesn’t work out, or if the trend is over in a flash, at least I didn’t spend a ton of money on it. No harm, no foul, right? 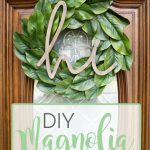 The thing I love about these little wood garlands is that they’re simple and cheap to make, plus they add a bit of interest to your decor. 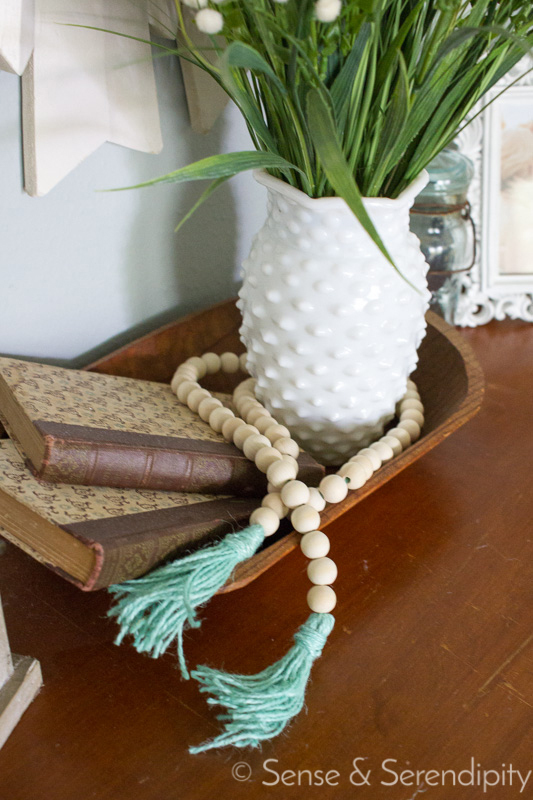 I also love that they incorporate natural wood elements and a pop of color (with the tassel). 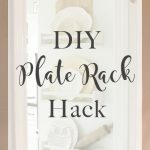 These will be great in the spring, but I think they’ll also look fantastic in your summer decor too! So, let’s get to the tutorial, shall we? First, wrap some twine around your hand (where your knuckles are) about 15-18 times. Cut the end of the twine and carefully remove the bundle of twine from your hand. Make sure each of the cut pieces of twine are hanging down from the top of the bundle. 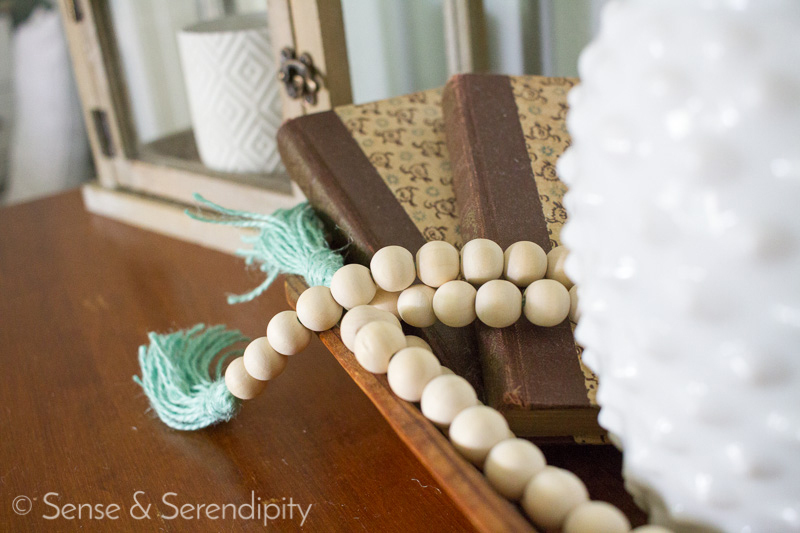 Set it aside. Cut a long length of twine, about 8 feet long. String one of the ends through the “top” of your bundle of twine and stop when you get to the middle of the long length of twine. 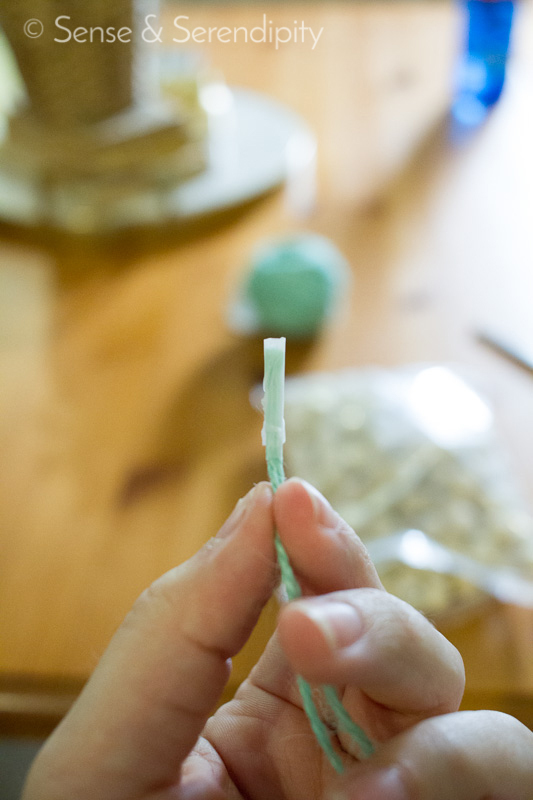 Then fold the other end of the long length up to meet the first end. 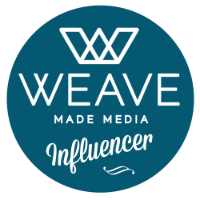 You now should have a 4-foot length of twine with your bundle hanging in the middle. Next, cut about an 18-inch length of twine and begin to wrap it around the top of your bundle to create a “neck.” Wrap as many times as you like and then tie it off in the back. Either cut your loose ends or tuck them into the bundle. 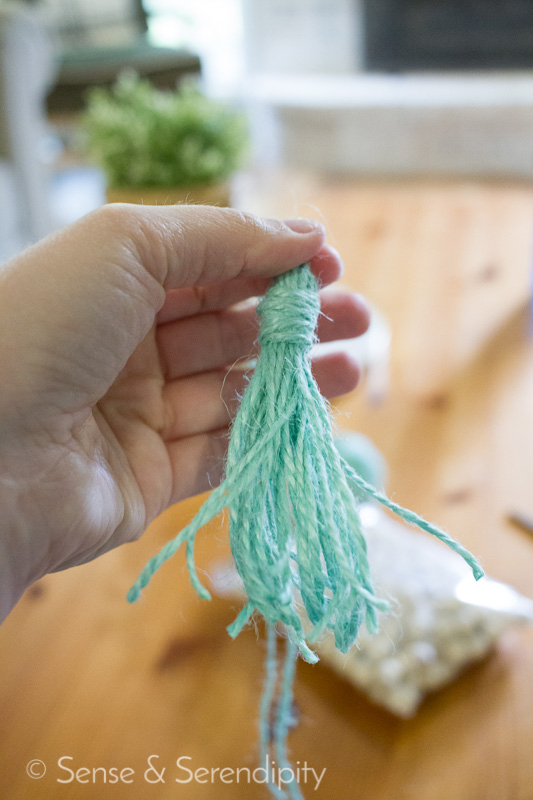 Now cut the loops at the bottom end of your bundle to create the tassels. You have your first tassel! 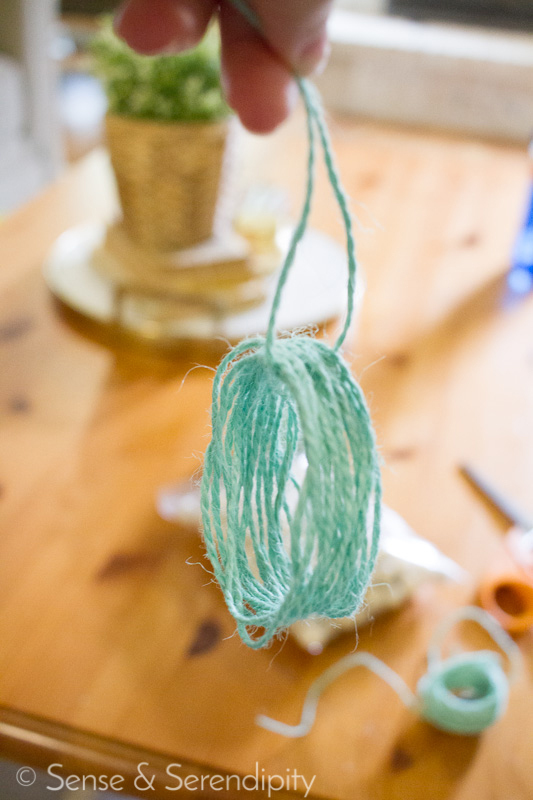 Next, take the two ends of the long length of twine and, using a bit of scotch tape, tape them together. 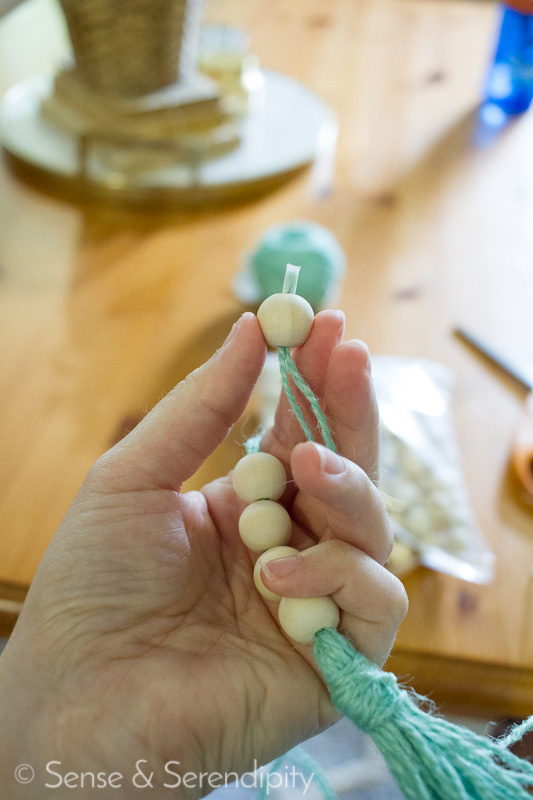 This is simply to make it easier for you to start beading the wood beads without your twine fraying. Now start beading! 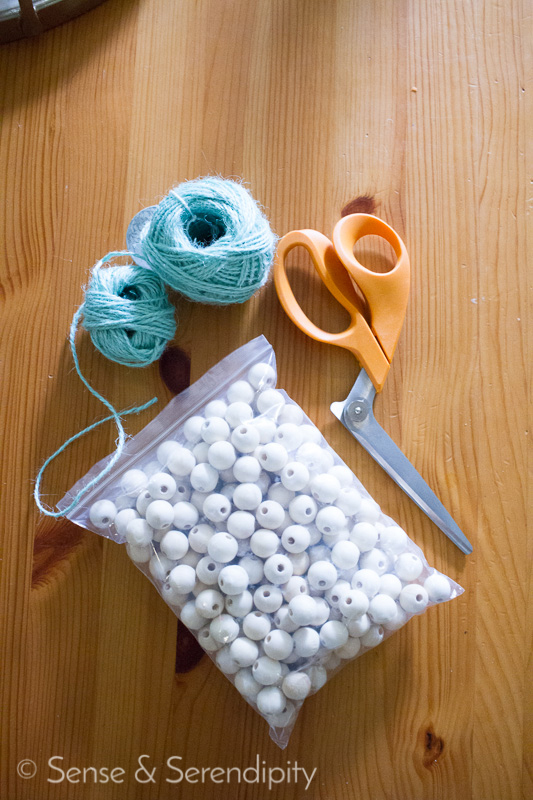 Put as many beads on as the length of your twine allows, but be sure to leave at least 1.5-inches of twine at the top. 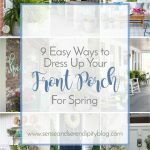 When you have all your beads on, remove the scotch tape and carefully set the garland aside and start to create your second tassel by winding more twine around your hand. 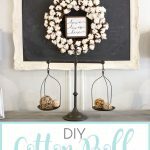 Once you have your bundle of twine, remove it and thread one end of the remaining twine of the garland through the top of your bundle. 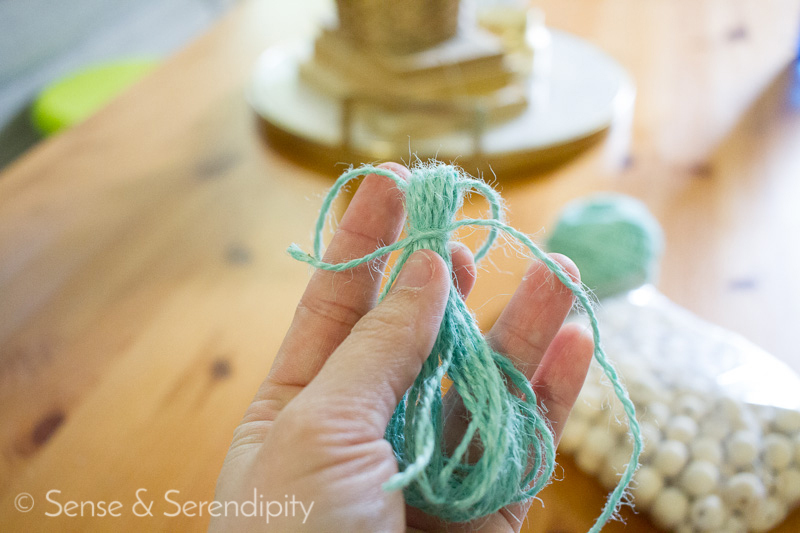 Tie a tight knot with the other end of the twine. Your bundle should now be hanging from the bottom of your garland over the two tied ends of the long length of twine. 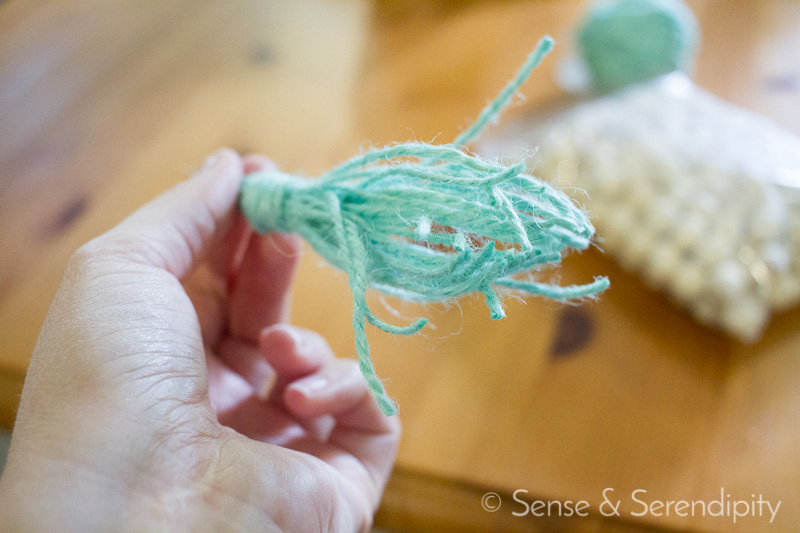 Take another 18-inch length of twine to wrap around the top of the second tassel, creating the neck. Tie off and hide the ends or cut them. Cut the bottom looped ends of the second tassel. You’re done! Not bad for a 10-minute project, right? I added my garland to the top of the dresser in my bedroom. I love how it turned out! 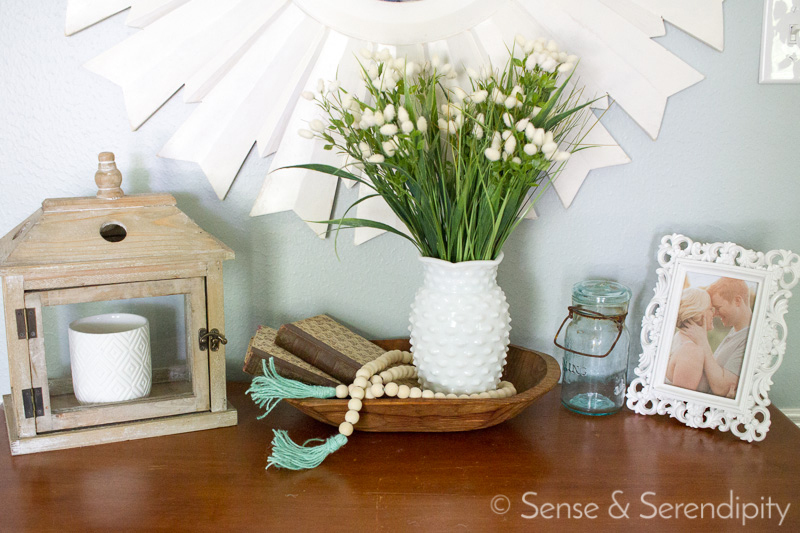 You can use any color twine your heart desires, or you can use a natural jute twine. 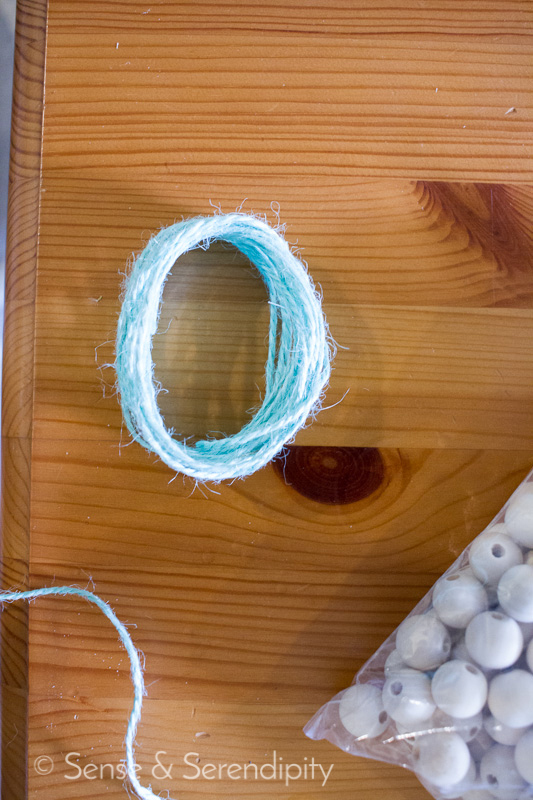 You can also use embroidery thread, I just happened to have the twine on hand. 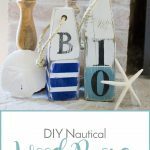 You could even paint the beads if you’re not into the natural wood look. 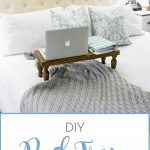 There are so many ways to make this project one-of-a-kind! 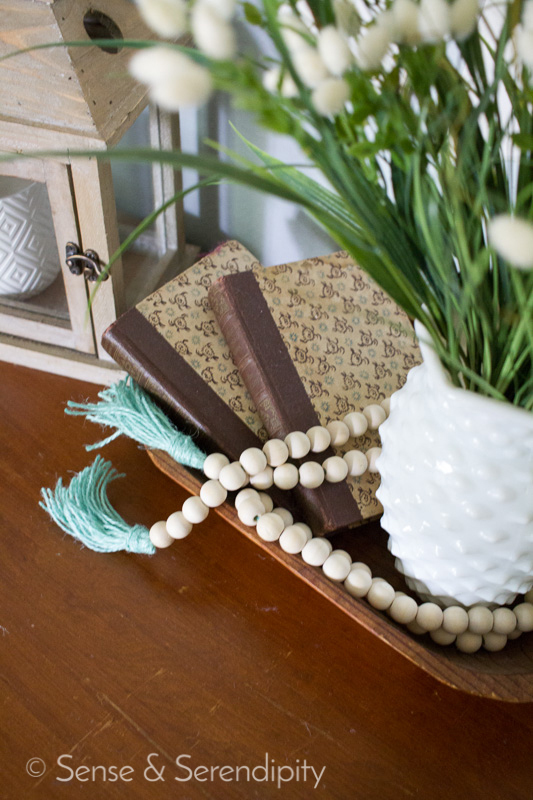 What do you think of the wood garland trend? 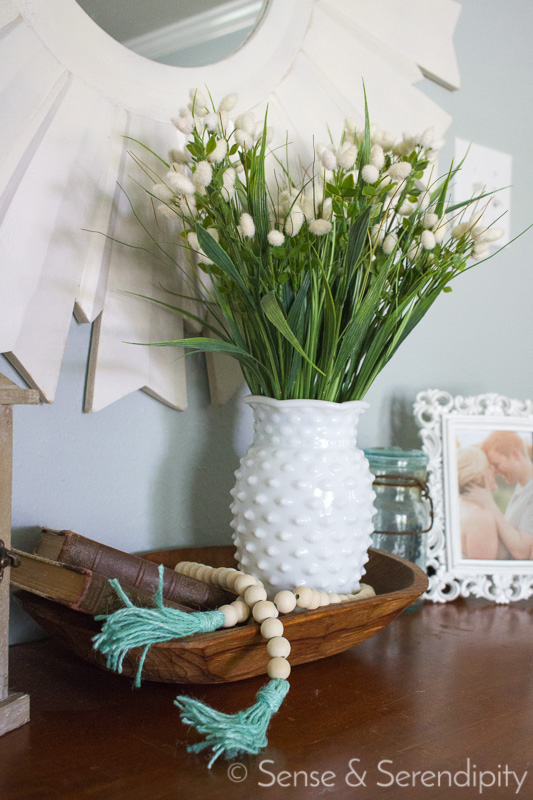 How do you like to use it in your decor?